Karen Bremer has had a long career in the restaurant industry, starting as a teenage S&S Cafeteria checker in Florida, where she walked the line to make sure food was properly displayed and priced. She was a restaurant manager and then president of the Peasant Restaurant Group, which helped change the way Atlantans dine out; and she owned and ran two fine dining establishments of her own, which closed in 2009. Bremer, now executive director of the Georgia Restaurant Association (GRA), understands the business side of restaurants, labor-intensive endeavors where the profit margin is 2 to 6 percent and the price of gasoline can affect everything from suppliers’ costs to customers’ willingness to drive five or 10 miles for a meal out. She also understands, on a personal level, the less quantifiable attributes of heart and soul that drive many restaurateurs and still feels keenly the loss of her own downtown Atlanta restaurants, victims of the recession. The restaurant industry, which includes just under 17,000 eating and drinking establishments, is the second largest private employer in the state behind agribusiness. Last year restaurants accounted for 405,800 jobs in Georgia – 10 percent of the state’s employment – and were expected to generate $16.5 billion in sales. Nationally, 990,000 restaurants employ 13.5 million and generate $683.4 billion. About half of Georgia’s restaurants are concentrated in Metro Atlanta, but every corner of the state shares in the bounty. Georgia is also home to several national restaurant chain headquarters, including Arby’s, Popeye’s, Chick-fil-A and FOCUS Brands, which owns Moe’s Southwest Grill, Cinnabon, Schlotzsky’s and McAlister’s Deli, among others. This is a fast-paced business in which fortunes and reputations can turn on a dime. “The restaurant industry is a manufacturing industry,” Bremer says. “The industry buys products raw, prepares and serves them in a 12-hour cycle.” Behind the scenes there are economic issues, public health concerns and workforce problems to contend with. There are lots of ways to slice and dice Georgia’s eating establishments: full-service, limited service, fine dining, fast-casual, QSR – for quick-serve restaurants, which the industry folks like better than the terms fast food or family dining. The GRA uses close to 100 classifications: Italian, Korean, steakhouses, seafood, doughnut shops, etc. But many in the industry think of restaurants in terms of chains and independents. The chains serve a lot of customers, but it’s the independents, typically chef-driven, that create the buzz and set the trends. And nobody does that better than Atlanta’s Ford Fry. Getting the right combination of concept, location, style, price point, environment and menu is more art than science. Fry, who has come up with some of Atlanta’s most intriguing and successful dining places, like The Optimist, No. 246 and St. Cecilia, describes his restaurants as upscale casual, reflecting the top-quality ingredients he uses and the relaxed, informal atmosphere he creates. The restaurant was a hit with both local diners and critics. It was named Restaurant of the Year in 2012 by Esquire magazine, and Bon Appetit included The Optimist as one of its Best New Restaurants in America in 2013. Fry was recruited to Atlanta in the late 1990s to run EatZi’s, a high-concept food market and bakery that closed in 2006. He found the city to his liking and valued the opportunity to learn more about the food business, but it took a little prodding from his brother-in-law, who became a financial backer, and a good business plan to get him out on his own. “My golden handcuffs were about to turn to platinum,” Fry says. JCT. Kitchen & Bar, his first restaurant, opened in 2007 on Atlanta’s Westside. Next came Decatur’s No. 246 in 2011, something of a risk, considering the still-lagging economy; but he was confident that diners would support a good restaurant. So is understanding the community the restaurant will serve. In Decatur, a sophisticated clientele looks for value. “I knew going in we would have to run lower margins on things to really speak to the community,” he says. Even in the toughest years, Fry says, none of his restaurants ever fell below a 10 percent annual increase in sales. 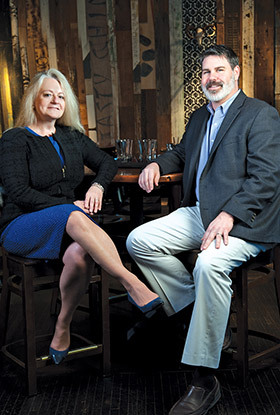 Certainly restaurants suffered during the recent recession – Bremer says about 1,000 closed, many of them fine dining establishments – but overall the industry proved pretty resilient. Bremer says Atlanta is a true destination dining spot. She credits the international population with helping to create a world-food culture and the influx of younger people who are more concerned with where their food comes from and what’s in it than older dining generations were. The easy availability of local produce and proximity to organic farms has helped restaurants stay on top of – and even lead – the movement toward healthy, farm-to-table fare. But this top-tier designation is fairly new. Georgia Trend’s longtime dining editor and restaurant critic Krista Reese recalls a number of “fancy” restaurants when she arrived in Atlanta nearly 30 years ago but says they were not necessarily fine-dining places. She considers Pano Karatassos the leader of the restaurant renaissance, marked by the opening of Pano’s and Paul’s, the first of the Buckhead Life restaurants. The Peasant Group [the Pleasant Peasant, Mick’s] played a part as well. “And then there was the Ritz-Carlton Buckhead Dining Room under Chef Guenter Seeger. It sparked a whole movement,” she says. Bacchanalia, opened more than 20 years ago by Anne Quatrano and Clifford Harrison, belongs on that list as well. [See our review in this month’s issue on page 78.] It has flourished as a spot for fine dining, although it moved from its original Buckhead location to the Westside. Chefs like Linton Hopkins of Restaurant Eugene and Holeman & Finch and Hugh Acheson of 5&10 and Empire State South have helped bring national attention to Georgia’s food scene and this new Southern style. They even shared a James Beard award – the restaurant industry’s equivalent of the Oscars – for Best Chef: Southeast in 2012. And although at one time Atlanta was far off the national food radar, it’s quickly being considered one of the next cities to watch. It’s not just Atlanta diners who are benefiting from the new restaurant trends. In Athens, Acheson, who started out with 5&10, has helped create a thriving restaurant scene that encourages younger chefs – like Peter Dale, his partner at The National. In other cities, the presence of a college campus, which generally provides a sophisticated clientele and a source of cheap labor, combines with a revived or reviving downtown to create opportunities for ambitious restaurants, Reese says – like the one Keira Moritz runs in Valdosta. Her sense that Valdosta was ready for such a place was bolstered by the presence of Valdosta State University and Moody Air Force Base. “Valdosta is different from Atlanta,” Moritz says, but that doesn’t translate as skimping on ingredients. “I buy good products that I’m proud to use. We have fairly decent prices for the market.” She acknowledges having to do “a little tinkering” with the initial menu. “You have to be ready to adjust if something doesn’t work,” she says. She offers a large meat selection featuring prime cuts. The menu changes three times a year, but shrimp and grits and deviled eggs are constants. She is about to open a new downtown venture, Birdie’s Market, which will sell wine, cheese, specialty items and some “grab and go” food items. Reese believes one of the next restaurant hot spots outside Atlanta will be North Georgia, where increasing numbers of retirees with time, interest and disposable income make the conditions right. She also sees St. Simons Island, with its share of well-to-do residents and well-heeled tourists, as ripe for additions to its dining scene. “For a long time, it seemed to be where people went to cook, not eat out,” she says. Savannah, going strong for a while but lately lagging, is also ready for a lift. Many who start out with a passion for food find their enthusiasm soon extends to the business side, and that can make all the difference. Turner grew up in New England and started as a restaurant server and line cook while he was in college. He came to Atlanta to work at Villa Christina, then had a “real job” that put him in a suit and tie, but came back to the restaurant industry and the Food Studio, where he and business partner Todd Mussman met. “We started talking about doing our own thing and within a couple of years got a business plan and in 2005 opened Muss and Turner’s,” a bistro in Smyrna. Next came Local Three Kitchen & Bar in West Buckhead and Common Quarter in East Cobb – casual places, geared to their communities. When they opened Local Three and brought on another partner, chef Chris Hall, Turner says, “It pushed me into an uncomfortable spot. I had to evolve as a leader and figure out ways to provide value to the organization.” That meant trusting his employees and learning to delegate. “I had to learn to effectively manage and lead myself, to effectively manage and lead and influence others and learn how to lead leaders.” It is a role he is now very comfortable in, and he finds the restaurant industry a good match for his interests. “I have an insatiable curiosity about human psychology and how to have a positive impact on it, and about business in general. You could not find a better laboratory to study both of those things. Every aspect of business is relevant in the restaurant industry – marketing, operations, logistics, finance and accounting,” he says. The fact that it may not always look difficult from the outside could explain why some restaurants simply don’t make it. “People who made money doing something else and want to get into the restaurant business tend to romanticize it,” Turner says. “If you are not experienced or well trained or determined to ‘weed and seed’ the garden every day, you’re going to get exposed pretty quickly,” he says. Beyond the concerns of individual restaurateurs, the industry pays attention to political and economic matters that affect the business climate. The GRA opposed HB 87, Georgia’s harsh immigration law. “We support immigration reform on the federal level,” Bremer says. “Let’s do it consistently across the U.S. Let’s come up with solutions. We need workers for our country.” The organization opposes an increase in the minimum wage, believing the industry needs the flexibility to pay as the market dictates. Chefs will continue to be the driving force in innovative and successful restaurants. “Customers want to relate to the chef, want to know who the chef is onsite at each restaurant,” Fry says. He and others hope it will become easier for up-and-coming chefs to secure leases in prime spots, and he applauds developers who take risks and work with young chef-entrepreneurs for their projects. So what’s on the table this year for those who dine out – which is pretty much all of us, since the average American eats seven meals a week away from home? Here are the Top 10 food trends from the National Restaurant Association. Bon appétit!